Established in 1938, the Commission manages 4 million acres of tide and submerged lands and the beds of navigable rivers, streams, lakes, bays, estuaries, inlets, and straits. These lands, often referred to as sovereign or Public Trust lands, stretch from the Klamath River and Goose Lake in the north to the Tijuana Estuary in the south, and the Colorado River in the east, and from the Pacific Coast 3 miles offshore in the west to world-famous Lake Tahoe in the east, and includes California’s two longest rivers, the Sacramento and San Joaquin. The Commission also monitors sovereign land granted in trust by the California Legislature to approximately 70 local jurisdictions that generally consist of prime waterfront lands and coastal waters. The Commission protects and enhances these lands and natural resources by issuing leases for use or development, providing public access, resolving boundaries between public and private lands, and implementing regulatory programs to protect state waters from oil spills and invasive species introductions. Through its actions, the Commission secures and safeguards the public’s access rights to navigable waterways and the coastline and preserves irreplaceable natural habitats for wildlife, vegetation, and biological communities. The Commission also protects state waters from marine invasive species introductions and prevents oil spills by providing the best achievable protection of the marine environment at all marine oil terminals in California and offshore oil platforms and production facilities. The State Lands Commission adopted a Strategic Plan on December 18, 2015. 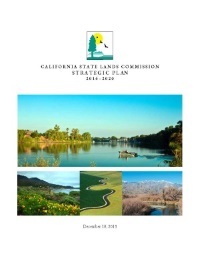 This plan, the culmination of robust stakeholder collaboration, positions the Commission as a leader in land and resource management, prioritizes transparency, establishes the highest levels of safety and environmental protection, and is anchored on leveraging technology to increase public engagement and to be more innovative and effective in its service to the people of California. The Commission manages hundreds of thousands of acres of sovereign lands and resources. Its primary responsibilities are issuing leases for use of these lands and resources, preventing oil spills at offshore platforms and marine oil terminals, and safeguarding state waters from marine invasive species introductions. This strategic plan equips the Commission to adapt to emerging challenges and opportunities, while creating a meaningful and rich framework to achieve California’s policy goals, champion public access, and enforce the protections of the Public Trust Doctrine. The status of the Commission’s implementation of the plan is below, including the current status for each action. The California State Lands Commission is a recognized leader that champions environmentally sustainable public land management and balanced resource protection for the benefit and enjoyment of all current and future generations of Californians. 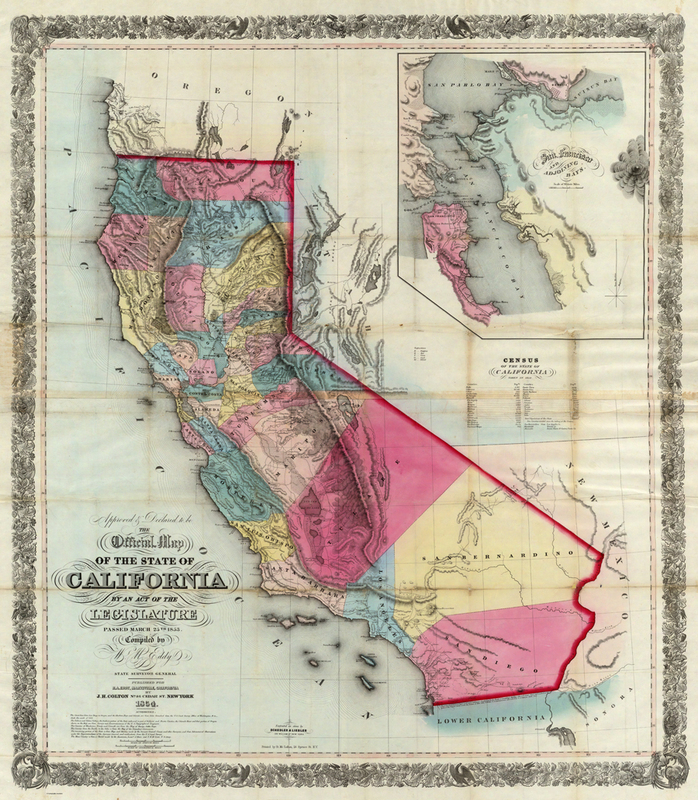 The office predating the Commission was created in 1849 by the California Constitution and was known as the Surveyor General. The Surveyor General, a constitutional officer elected by the people, surveyed and mapped the boundaries of state sovereign land, determined the state’s mineral resource potential, and determined its agricultural and domestic animal population. The Surveyor General was also the engineer and commissioner of improvements of roads, canals, timber resources, draining of marshes, and irrigation project development. The office was abolished in 1929 and its responsibilities were transferred to the Department of Finance and its Division of State Lands. In 1937, serious irregularities surfaced regarding the execution of a boundary line agreement in Malibu, settlement of trespass litigation that had been brought against Union Oil, and the issuance of permits for oil drilling in Huntington Beach. A Division Chief and Petroleum Production Inspector were charged and dismissed from state service by the Personnel Board. The necessity of an independent commission that makes its decisions in public was made apparent by the behavior of these individuals. Because of this malfeasance and the significant controversy surrounding the state’s management and development of its oil and gas resources, and because of a desire to create a high level and autonomous board to make its decisions in a public forum, the State Lands Act was established in 1938 and the California State Lands Commission was created. The Commission was created as an independent body consisting of three members. Since 1938, the Commission has consisted of these same members: the Lieutenant Governor, the State Controller, and the Governor’s Director of Finance. The combination of the two principal financial officers of the state with two statewide elected officials ensures that decisions made by the Commission are fiscally sound and in the best interests of the state. Public awareness and participation is assured because Commission actions occur at properly noticed public meetings. Under the direction of the Executive Officer, the Executive Office plans, organizes, manages, coordinates and administers the work of the Commission staff consistent with the decisions, policies, and programs established by the Commission and the Legislature. The Executive Office employs the expertise of staff in each of the Commission’s divisions to accomplish the Commission’s mission, vision, and Strategic Plan objectives while responding to emerging challenges. The Administrative Services Division is a customer service division that provides a full-range of vital administrative services in support of the Commission staff. The division includes the Fiscal, Human Resources, Accounting, Equal Employment Opportunity, Records Management, Business Services, and Office Services Units. The Environmental Planning and Management Division provides policy and technical analysis to the Commission and its Executive Officer, and ensures compliance with the California Environmental Quality Act (CEQA). The Division prepares Environmental Impact Reports, Mitigated Negative Declarations, and other environmental or public trust documents for land use changes within the Commission’s jurisdiction, and routinely comments on CEQA documents prepared by local, state and federal agencies for projects impacting public trust lands and resources. The External Affairs Division manages the Commission’s granted lands program and is responsible for ensuring that the Commission is fulfilling its oversight responsibilities over legislatively granted public trust lands. The Division also serves as a resource for grantees, and as part of that, maintains relationships with ports, harbor districts, cities, counties and other municipalities managing granted public trust lands. The Division also plans, develops, organizes, directs and coordinates the Commission’s state and federal legislative program; and the Division Chief is the Public Information Officer for the Commission. In addition, the Division manages the contents of the Commission’s public website and is responsible for coordinating and fulfilling requests under the California Public Records Act. The Information Services Division provides secure, reliable and efficient computing services enabling the Commission to conduct business effectively. The scope of services includes workstations and laptops, phones, cloud collaboration services, a secure server and network infrastructure and applications for employees and the public. The Land Management Division has primary responsibility for the surface management of all sovereign and school lands in California. This includes the identification, location, and evaluation of the state’s interest in these lands and their leasing and management. Sovereign lands encompass approximately four million acres and include over 120 rivers and sloughs, 40 lakes, and tidelands and submerged lands along the more than 1,130 miles of coastline and offshore from the ordinary high water mark to three nautical miles offshore. School lands are generally located in the California desert and are what remain of the nearly 5.5 million acres granted to California by Congress in 1853 to benefit public education. The Commission manages the surface and mineral ownership of hundreds of thousands of acres of school lands. The Legal Division’s staff attorneys provide legal advice and support to the Commission, to the Executive Office, and to the other Divisions of the agency. Staff attorneys interpret, apply, and provide advice concerning statutes, regulations, and case law governing all aspects of the ownership, management, and use of lands under the Commission’s jurisdiction. The Marine Environmental Protection Division regulates and inspects all marine oil terminals in California and bulk oil operations at these terminals to provide the best achievable protection of the public health, safety, and the environment. Inspections are conducted on a daily, biennial, and annual basis and include marine pipeline inspections, review of oil spill prevention requirements, and operational personnel training. The Division also regulates large oceangoing vessels to protect against the introduction of invasive (nonindigenous) species into state waters. The Mineral Resources Management Division is responsible for the safe and environmentally sound development, regulation, and management of all energy and mineral resources on sovereign and school lands under the jurisdiction of the Commission. These resources include oil, gas, geothermal energy, gold and other solid minerals. In managing the prudent development of these resources, the Division’s highest priorities are public safety, environmental protection, and maximizing revenue generation. The Division also provides resource management and engineering support to other state and local agencies. The Division manages energy and mineral resource development and use through approximately 130 oil, gas, geothermal, and mineral leases covering more than 95,000 acres of land on and offshore. These resources are diverse and range from commercially valuable minerals such as oil, natural gas, hard rock minerals, sand, gravel and geothermal steam to unique natural resources such as forests, grazing lands, wetlands, riparian vegetation and fish and wildlife habitat. Many sovereign and school lands possess renewable energy potential utilizing technologies that develop clean, carbon free energy such as solar, wind, geothermal, tidal and wave generators.